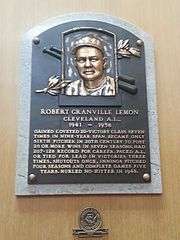 Robert Granville "Bob" Lemon (September 22, 1920 – January 11, 2000) was an American right-handed pitcher and manager in Major League Baseball (MLB). Lemon was elected to the National Baseball Hall of Fame as a player in 1976. Bob Lemon was born in San Bernardino, California. Lemon's father, Earl Lemon, ran an ice business and later moved the family to Long Beach, California. There, Lemon attended Wilson Classical High School and played shortstop on the school's baseball team. He was recognized as the state baseball player of the year by the California Interscholastic Federation (CIF) Southern Section in 1938. Later that same year, at the age of 17, Lemon began his professional baseball career in the farm system of the Cleveland Indians as a member of the Oswego Netherlands of the Canadian–American League and later that year, the Middle Atlantic League's Springfield Indians. In 75 games with the Netherlands he recorded a .312 batting average. The following season he played 80 games with Springfield, and hit .293, and then joined the New Orleans Pelicans of the Southern Association, where Lemon hit .309. He spent the next two seasons at the Class A level with the Eastern League's Wilkes-Barre Barons as he hit .255 in 1940 and .301 in 1941. In his final stint in the minors, Lemon hit .268 with 21 home runs for the 1942 Baltimore Orioles of the International League. Lemon's major league debut came as a third baseman as a late season call-up on September 9, 1941. He appeared in five games and collected one hit in five plate appearances. He was joined by catcher and fellow rookie Jim Hegan. :p.109 He repeated the same number of games in the 1942 season and failed to record a hit. Lemon served in the United States Navy during World War II and missed the next three seasons. Before leaving for tour duty in 1943, Lemon married Jane McGee. Lemon was the Indians' center fielder for Opening Day in 1946. On April 30, Indians pitcher Bob Feller no-hit the New York Yankees; Feller later wrote that Lemon's "daring catch" and "throwing to and doubling a man off second base" were key in "saving my" no-hitter. By season's end, however, Lemon had entered more games as a pitcher than a utility player. Before that season, Lemon had only pitched one inning while with Oswego and another while with Wilkes-Barre. Birdie Tebbetts of the Detroit Tigers and Johnny Pesky of the Boston Red Sox had played against Lemon in Navy baseball games, and they spoke to Indians player-manager Lou Boudreau about switching Lemon from the outfield to the pitching mound. Boudreau discussed the potential move to pitcher with Yankees catcher Bill Dickey, who had also played in the Navy with Lemon. "I knew Lemon had a strong arm, and once I realized he was not going to hit with consistency as an outfielder, I thought it would be worthwhile to look at him as a pitcher", Boudreau later wrote. :p.86 Lemon resisted the idea at first, but he agreed to the change after he learned that his salary could be higher as a pitcher. Lemon credited Indians coach Bill McKechnie with helping him to adjust to his new position. :p.93 Indians pitching coach Mel Harder taught Lemon how to throw a slider, a key pitch in his repertoire. :p.38 That same year, Indians owner Bill Veeck said that Lemon "some day will become the best pitcher in the American League." Lemon finished the 1946 season with a losing record (4–5), the only one he would have until 1957, and a career-low 2.49 ERA. He followed up his inaugural season as a pitcher with an 11–5 record. He appeared in 19 games before August, largely as a relief pitcher, but he made his first start in July against the Boston Red Sox. During the last two months of the season, Lemon went 9–3 and pitched six complete games, including two 11-inning outings. Before the 1948 season started, team president Bill Veeck doubled Lemon's contract amount. It would be Lemon's first full season as a pitcher. Lemon was the Indians' number-two pitcher in the starting rotation, behind Bob Feller. On June 30, 1948, Lemon pitched a no-hitter against the Detroit Tigers in a 2–0 win, earning his 11th win and fifth shutout of the season. He became the ninth Indians pitcher to record a no-hitter and ended the season with an AL-best 20 complete games. His ten shutouts on the season were the most in the majors. Lemon would go on to win the 1948 AL Pitcher of the Year Award. With three games remaining in the regular season, 20-game winner Lemon started the first game of their final series against Detroit. Lemon allowed three runs on seven hits and the Indians lost the game. Cleveland lost two games of the three-game series, forcing a one-game playoff with the Boston Red Sox. Speculation built up around which Indians pitcher Boudreau would send to the mound against the Red Sox on October 4; the choices were largely narrowed down to Lemon and Satchel Paige. Lemon was listed as Cleveland's "probable pitcher" by United Press International in morning newspapers the day of the game, even though he would be working on two days of rest. Instead, Boudreau went with Gene Bearden, who would be pitching on one day of rest, and the choice was solidified when veteran second baseman Joe Gordon spoke up in support of Boudreau at a team meeting. The Indians won the game at Fenway Park by a score of 8–3 and prepared to face the Boston Braves in the World Series. Boudreau started Feller in game one, which Cleveland lost. Lemon was the starter in the second game. Lemon faced Warren Spahn, and Cleveland won 4–1. Lemon was named the starter for game six in Boston with the Indians leading the series 3–2. He allowed three earned runs on eight hits and Cleveland had the lead when Lemon was replaced by Bearden. The Braves scored two runs in the bottom of the eighth inning but the Indians won the game, 4–3, to clinch the franchise's first World Series title since 1920. Lemon was the only pitcher from either club to win two games in the Series. He finished the Series with a 1.65 ERA. Lemon's hitting skills began to get attention as well. By August 1949, Lemon was batting .295 with 11 extra-base hits and six home runs, prompting Yankees manager Casey Stengel to comment, "Well, I see where the Indians have nine hitters in the lineup instead of eight." Columnist Milton Richman wrote, "Lemon's fine work at the plate has also conspired to tire him more. When the Indians get behind and Lemon is pitching, he rarely is yanked for a pinch hitter in the early innings. It's a tough price he's paying for batting fame." In 1950, Lemon led the major leagues in pitching wins (23) for the first time and he would win his second AL Pitcher of the Year Award. He pitched a six-hit complete game over the Detroit Tigers in his last start of the season on September 29. When Lemon signed a new contract before the 1951 season, the Indians made him the highest paid pitcher in baseball. At the beginning of the 1951 season, columnist Oscar Fraley pointed out that Lemon was one of only 12 active pitchers who had earned a winning record in four consecutive seasons. He finished the season with a 3.52 ERA, lower than the 1950 season mark of 3.84 when he led the majors with 23 wins, and a 17–14 record. The loss total was the most in the AL. He did not record his first shutout of the season until well into August, when he earned a three-hit win over the Chicago White Sox. Upon completion of the 1952 season, Lemon recorded the second-lowest ERA of his career, 2.50, and went 22–11. His 28 complete games were a career-high and led the AL. He joined teammates Early Wynn (23) and Mike Garcia (22) as part of a Cleveland starting rotation which featured three 20-game winners. On Opening Day of the 1953 season, Lemon pitched a one-hitter against the Chicago White Sox and earned a win. He finished the season with a 21–15 record, 3.36 ERA and led the AL in innings pitched for the fourth and final time of his career. In 1954 he was 23–7 and won his third AL Pitcher of the Year Award as Cleveland won the pennant. The Indians set an AL record with 111 wins. (The record stood until major league seasons were lengthened to 162 games, and it has been surpassed twice since then.) Lemon was named Cleveland's starter for game one of the 1954 World Series. After nine innings, the Indians and Giants were tied 2–2. Lemon stayed in the game to pitch the tenth and final inning, but he surrendered a three-run home run to pinch hitter Dusty Rhodes and the Indians lost, 5–2. Indians manager Al López went with Lemon again in the fourth game after only two days rest. "He hasn't worked that close together all year because we had a good bunch of other pitchers, but a year ago, he and Wynn and Garcia pitched every third day for practically a month. Bob will be all right", Lopez said. Lemon and the Indians lost the game, 7–4, as the Giants swept the Series four games to none. In his two appearances, he went 0–2 with a 6.75 ERA, allowed eight walks and recorded 11 strikeouts. Lemon began the 1955 season with a 5–0 record in April, but he was the only Cleveland starting pitcher with a winning record that month. His 18 wins tied for the most in the AL that year. He recorded five complete games through May 30 but none after that date. Indians general manager Hank Greenberg got Lemon to agree to his first reduction in contract salary since joining the organization. Lemon earned his 200th career win against the Baltimore Orioles on September 11, 1956, and he also hit a home run that day. He finished the season with a 20–14 record, the last of his seven career 20-win seasons, and led the AL in complete games (21). On August 13, 1957, it was announced that Lemon would not finish the season due to continued irritation to his elbow after bone chips were found earlier in the season. Lemon ended the season with a record of 6–11, his first losing record since 1946. In 1958, Lemon was the oldest Indian on the roster at age 37. Lemon pitched 3.1 innings over the span of two games before he was put on the Indians' disabled list and sent to the Triple-A San Diego Padres. There he continued physical conditioning and mentored the pitching staff of the Indians' top farm club. He appeared in 12 games with the Padres, going 2–5, with a 4.34 ERA, 22 walks, and 19 strikeouts. He returned to pitch for the Indians on May 25 in a relief role, but he appeared in only nine games that season. He earned just one decision that year, a loss, which brought his career pitching record to 207–128. The club put him on waivers in July. At 38, Lemon went to Tucson in 1959 to attend Indians' spring training camp. He told manager Joe Gordon that he was willing to become a relief pitcher, but he retired as a player on March 5, stating, "I just couldn't keep up with the young fellows anymore." He accepted a scouting role with the Indians. Bob Lemon's number 21 was retired by the Cleveland Indians in 1998. Lemon retired in 1958 with 207 wins, all but ten of them occurring in a ten-year span. He recorded 274 hits in 1,1883 at-bats (.232), and his 37 career home runs are second on the all-time career list for pitchers (behind Wes Ferrell's 38). :p.198 In 1951, Ted Williams had written of Lemon: "I have to rate Lemon as one of the very best pitchers I ever faced. His ball was always moving, hard, sinking, fast-breaking. You could never really uhmmmph with Lemon". :p.37 The Indians organization retired Lemon's jersey number, 21, in 1998, making him the sixth Indian to receive the honor. In 1959, Lemon became a scout for Cleveland. The next season he became a coach with the Indians. In 1961, he joined the Philadelphia Phillies coaching staff. The California Angels hired him as their pitching coach for 1967–1968. In 1976, Lemon served as pitching coach for the AL champion New York Yankees. The Yankees were owned by Cleveland-area native George Steinbrenner and they had been the chief antagonists of the Cleveland Indians during Lemon's pitching years. In recognition of his election to the Hall of Fame, Lemon was named honorary captain of the AL team for the All-Star Game. "Lopez always handled his players like I'd want to be handled. He treated men like men. He made them feel relaxed. That's the only way to play this game...by being relaxed. You can't be worried about the manager getting on you. All the time I was at Cleveland, I saw Lopez get mad only twice. He never showed anybody up. I don't do it either." "I know many major league owners are against hiring a former pitcher as manager and I've always wondered why. Pitching is 75 per cent of the game. If it's so important, why not have a former pitcher as manager? He can always have someone else run the other 25 per cent of the club." In 1971, Lemon guided the Royals to their first winning season since the franchise began as an expansion team in 1969. Lemon finished second in the Associated Press AL Manager of the Year voting. Before the 1972 season, Lemon talked about the team's chances, saying "Five clubs could win it, including ourselves." However, the Royals finished 76–78 in Lemon's last year with the club. Royals owner Ewing Kauffman fired Lemon as manager and stated that he wanted a younger person to fill the position and "did not want to lose Jack McKeon", who was named as Lemon's replacement. Royals outfielder Lou Piniella was one of several players who disagreed with Kauffman's decision, saying, "...Lemon deserved to manage the club next year." His third and final stint in the PCL was with the Sacramento Solons in 1974. His last minor league managerial position came the following season with the International League's Richmond Braves. Bill Veeck hired Lemon to succeed Paul Richards as the Chicago White Sox manager on November 16, 1976. Lemon took over a Chicago team that finished in last place in the AL West in 1976. "Bob is the type of manager we need at this stage of the game", Veeck said. During spring training of 1977, Lemon said, "I think we'll surprise a few people." White Sox shortstop Alan Bannister quickly noticed a difference. Comparing Richards to Lemon, Bannister said, "He'd post the lineups 10 minutes before the game, and only then we'd find out who was playing and where. Lemon's made it a serious operation." As late as August 14, the White Sox were in first place in the AL West. The White Sox finished with a 90–72 record, a 26-game improvement. The team finished third in AL West and Lemon won his second Manager of the Year Award. "The fans got behind us after about three weeks. They had a lot to do with our success", Lemon said after being winning the award. Lemon was fired the following season on June 30, 1978, by Veeck after Chicago posted a 34–40 record in the first half of the 1978 season. He was replaced by former Indians' teammate Larry Doby. "This change is not meant as any commentary on Lemon's ability but rather was the result of unusual circumstances which seemed to make a change necessary", said Veeck. Yankees manager Billy Martin resigned on July 24, 1978, and team president Al Rosen called Lemon to offer him the vacant position. He was announced as the new manager the next day. At their 1978 Old Timers Day five days after the Martin–Lemon changeover, the Yankees divulged that Lemon would be moved in 1980 to general manager, and they said that Martin would then return as field manager. The announcement was made by public-address announcer Bob Sheppard after the Old Timers had been announced and it was accompanied by Martin's dramatic entrance from the Yankee dugout. Martin received a long standing ovation from fans. Lemon responded to his new job—and to the newspaper strike that helped calm down the atmosphere in the Yankees clubhouse—by guiding the Yankees to the 1978 pennant. The Yankees, who trailed the Red Sox by 14 games at one point in July, pulled even with the Red Sox by defeating them in a four-game September series known as the "Boston Massacre. ":p.294 The Yankees pulled ahead by three and a half games, but the Red Sox rallied to tie the Yanks by the final day of the season. A one-game playoff would determine the AL Eastern Division winner. Ron Guidry was named the Yankees' starting pitcher for the October 2 playoff game at Fenway Park. Guidry was able to pitch "because of Lemon's good planning. ":p.295 The Yankees defeated Boston for the division title in the tie-breaker game, punctuated both by a dramatic three-run home run by Bucky Dent in the seventh inning, and an eighth-inning homer by Reggie Jackson that proved the game's winning run. Lemon became the third manager in MLB history to replace another mid-season and win the pennant. :p.294 Lemon's Yankees then beat the Royals in the ALCS and defeated the Los Angeles Dodgers to win the World Series title. With the Series win, Lemon became the first AL manager and third MLB manager to take over a team mid-season and win a World Series. Before the World Series, one columnist wrote, "...many observers feel that Lemon's low-keyed approach with the Yankees' temperamental millionaires as compared to the combativeness of Martin served to mold a spirit of togetherness among the Yankees that did not even exist last year when they won it all." Lemon and his handling of the season was described in The New York Times as "an island of calm in a stormy summer." Changes Lemon made during the season included returning Thurman Munson to the team's every day catcher (he had been playing in the outfield), putting Jackson in the clean-up spot in the batting order and becoming the regular right fielder, and pitching Ed Figueroa every fourth day (instead of fifth). :p.295 In October, Lemon was named the Associated Press' AL Manager of the Year, the second time he received such an award. Lemon's 26-year-old son, Jerry, was killed in an automobile accident in the fall of 1978, 10 days after Lemon won the World Series. The following season with the Yankees at 34–31, Lemon was fired in June by Steinbrenner and replaced by Martin, but he remained with the organization as he had a contract through the 1982 season. Speaking of Martin, Lemon said, "He's a very likeable guy, a free spirit. Where maybe I keep things inside, he lets them come out. There's nothing wrong with that." The Yankees finished in fourth place in the AL East (89–71). :p.292 Lemon worked as a scout for the Yankees and received "several offers" from other teams to serve as manager. :p.295 One offer came in 1979 from the Indians, but Lemon refused it as well as the others. Steinbrenner named Lemon the team's field manager a second time on September 6, 1981, the sixth Yankees' manager change since 1978. Lemon moved on to the post-season and dispatched the Milwaukee Brewers and the Billy Martin-led Oakland Athletics, and won the first two games of the 1981 World Series against the Dodgers, only to lose four straight and the Series. Lemon survived just a few weeks into the 1982 season (the Yankees were 6–8) before Steinbrenner dismissed him one last time, despite a promise for Steinbrenner he would manage the season "no matter what. ":p.295:p.40 Of the agreement between Lemon and Steinbrenner, Steinbrenner said, "Lem and I talked. He said it was O.K. He said he didn't take it as a promise anyway. ":p.45 Gene Michael succeeded Lemon as manager. He had managed just over one full season of games (172) for the Yankees, winning 99 games for a .576 winning percentage. Lemon suffered a stroke in his later years. Lemon died in 2000 in Long Beach, California, where he had been a permanent resident since his career as a player. Former teammate Bob Feller said, "Bob had a good curve, a good slider, and a vicious sinker pitch. He wasn't overly fast, but he always stayed ahead of the hitters and he didn't walk many batters, which is the key to success in the majors." 1 2 3 Martin, Johnny (April 6, 1951). "My Favorite Big League Ball Player – Bob Lemon". The Mount Airy News. p. 13. Retrieved September 9, 2012. ↑ Schipper, Bill (June 18, 1960). "Baseball Knows No Sympathy" (PDF). The Torrance Herald. Torranceca.gov. p. 8. Retrieved September 9, 2012. 1 2 3 4 5 "Bob Lemon Minor League Statistics & History". Baseball-Reference.com. Retrieved August 31, 2012. ↑ Bradham, Kelly (June 11, 1978). "Bob Lemon recounts glory years of Tribe". The Nevada Herald. p. 8. Retrieved September 1, 2012. 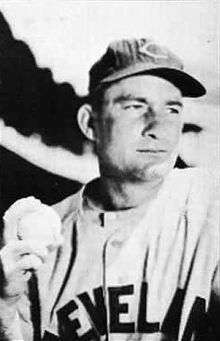 ↑ "Bob Lemon 1941 Batting Gamelogs". Baseball-Reference.com. Retrieved September 7, 2012. ↑ Dickson, Paul (2012). Bill Veeck: Baseball's Greatest Maverick. New York: Walker Publishing Company. ISBN 978-0-8027-1778-8. 1 2 3 4 5 6 7 8 9 10 "Bob Lemon Statistics and History". Baseball-Reference.com. Retrieved September 9, 2012. ↑ Moore, Roger (June 14, 1970). "Royals Manager Once A Flop As Major League Outfielder". Daily News. Bowling Green, Kentucky. Associated Press. p. 17. Retrieved September 2, 2012. 1 2 Koppett, Leonard (July 27, 1978). "Bob Lemon: No One Has A Bad Word About Him". Sarasota Herald-Tribune. New York Times News Service. p. D. Retrieved September 1, 2012. 1 2 Feller, Bob; Rocks, Burton (2001). Bob Feller's Little Black Book of Baseball Wisdom. Chicago: Contemporary Books. p. 40. ISBN 0-8092-9843-0. 1 2 Lemon, Bob (July 21, 1956). "Pitching Tips". The Gettysburg Times. Associated Press. p. 5. Retrieved September 9, 2012. 1 2 Boudreau, Lou; Schneider, Russell (1993). Lou Boudreau: Covering All the Bases. Chicago: Sagamore Publishing. ISBN 0-915611-72-4. ↑ "Hall of Famer Boudreau Dies". Portsmouth Daily Times. Associated Press. August 12, 2001. p. B6. Retrieved September 1, 2012. 1 2 James, Bill; Neyer, Rob (2004). The Neyer/James Guide to Pitchers: An Historical Compendium of Pitching, Pitchers, and Pitches. New York: Fireside. ISBN 0-7432-6158-5. ↑ Reichler, Joe (July 1, 1948). "Veeck Prophesied Lemon Would Top League Pitchers". Ellensburg Daily Record. Associated Press. p. 8. ↑ "Bob Lemon 1947 Pitching Gamelogs". Baseball-Reference.com. Retrieved September 9, 2012. ↑ "Bob Lemon Signs 1948 Tribe Contract". Milwaukee Sentinel. Associated Press. January 1, 1948. p. 12. Retrieved September 1, 2012. 1 2 3 "Indians recognize team which won 1948 Series". Portsmouth Daily Times. Associated Press. June 20, 1998. p. B3. Retrieved September 1, 2012. ↑ Reichler, Joe (May 26, 1948). "Bob Lemon Sweet Find For Indians". The Evening Independent. St. Petersburg, Florida. Associated Press. p. 14. Retrieved September 1, 2012. ↑ "Bob Lemon Hurls No-Hitter For Indians, Humbles Detroit Team To Record 11th Win". The Ottawa Citizen. Associated Press. July 1, 1948. Retrieved August 31, 2012. 1 2 "Bob Lemon has a good track record". The Palm Beach Post. July 25, 1978. p. 2C. Retrieved August 31, 2012. ↑ "1948 Cleveland Indians – Schedule, Box Scores and Splits". Baseball-Reference.com. Retrieved September 1, 2012. ↑ "October 1, 1948 Detroit Tigers at Cleveland Indians Play by Play and Box Score". Baseball-Reference.com. Retrieved September 1, 2012. ↑ Rhoden, Ralph (October 1, 1948). "Bob Lemon Hurls Today for Tribe; Yanks, Bosox Win". The Modesto Bee. Associated Press. Retrieved September 1, 2012. ↑ "American League Race Ends In Deadlock For First Time In History". Reading Eagle. United Press International. October 4, 1948. p. 16. Retrieved September 1, 2012. ↑ Richman, Milton (April 29, 1976). "Gene Bearden Rather Talk About Songwriting". The Harlan Daily Enterprise. United Press International. p. 2. Retrieved September 1, 2012. ↑ Richman, Milton (January 22, 1970). "Boudreau Recalls Days Of Action". The Dispatch. Lexington, Kentucky. United Press International. p. 14. Retrieved September 1, 2012. 1 2 "1948 World Series – Cleveland Indians Over Boston Braves (4–2)". Baseball-Reference.com. Retrieved September 1, 2012. ↑ "October 11, 1948 World Series Game 6, Indians at Braves". Baseball-Reference.com. Retrieved September 2, 2012. ↑ Richman, Milton (August 7, 1949). "Bob Lemon Is Demon At Plate". Sunday Herald. Bridgeport, Connecticut. United Press International. p. 36. Retrieved August 31, 2012. ↑ Richman, Milton (September 17, 1950). "Bob Lemon Can't Win No. 20 Because He's Just Plain Tired". The Sunday Star. Wilmington, Delaware. United Press International. p. 24. Retrieved September 2, 2012. ↑ "Indians Clip Tigers Behind Lemon, 12 to 2". Pittsburgh Post-Gazette. Associated Press. September 30, 1950. p. 12. Retrieved September 7, 2012. ↑ "Indians To Sign Lemon". Greensburg Daily Tribune. United Press International. March 1, 1951. p. 24. Retrieved September 2, 2012. ↑ Fraley, Oscar (April 7, 1951). "Pitching Power Big Problem In Majors". The Times-News. United Press International. p. 8. Retrieved September 2, 2012. ↑ "Mitchell Booms Pair; Indians Cuff Sox". The Telegraph-Herald. Dubuque, Iowa. Associated Press. August 19, 1951. p. 18. Retrieved September 7, 2012. ↑ "1952 American League Pitching Leaders". Baseball-Reference.com. Retrieved September 2, 2012. ↑ Phlegar, Ben (May 6, 1954). "Lemon off to good start sixth 20-game season". Sarasota Journal. Associated Press. p. 11. Retrieved September 2, 2012. ↑ "American League Team Win Totals". Baseball-Reference.com. Retrieved September 7, 2012. ↑ "Indians History Overview: The Glory Years". Mlb.com. Retrieved September 7, 2012. ↑ "Dejected Lopez Puts Faith in Bob Lemon For Fourth Game". The Daytona Beach Morning Journal. Associated Press. October 1, 1954. p. 9. ↑ "Bob Lemon Pitching Statistics & History". Baseball-Reference.com. Retrieved September 1, 2012. ↑ Lundquist, Carl (April 27, 1955). "Lemon Off To Brilliant Start For Cleveland Indians". Greensburg Daily Tribune. United Press International. p. 23. Retrieved September 2, 2012. ↑ "Bob Lemon 1955 Pitching Gamelogs". Baseball-Reference.com. ↑ "Bob Lemon Will Be After 200-victory Mark In 1956". The Telegraph-Herald. Dubuque, Iowa. United Press International. February 14, 1956. p. 9. Retrieved September 2, 2012. ↑ "Lemon Wins 200th, Beats Orioles 3 to 1". St. Petersburg Times. Associated Press. September 12, 1956. p. 11. Retrieved September 1, 2012. ↑ "Tribe's Lemon Out For Year". The Victoria Advocate. Associated Press. August 14, 1957. Retrieved September 2, 2012. ↑ "Indians Send Bob Lemon To San Diego". The Portsmouth Times. Associated Press. April 25, 1958. p. 21. Retrieved September 1, 2012. ↑ "Bob Lemon 1958 Pitching Gamelogs". Baseball-Reference.com. Retrieved September 2, 2012. ↑ "Cleveland Indians Ask For Waivers On Bob Lemon". Sarasota Herald-Tribune. Associated Press. July 3, 1958. p. 14. Retrieved September 2, 2012. ↑ "Bob Lemon Announces Retirement: Young Fellows Just Too Fast". The Edmonton Journal. Associated Press. March 6, 1959. p. 8. Retrieved August 31, 2012. 1 2 3 4 5 6 7 8 9 Gallagher, Mark (2003). Susan M. McKinney, ed. The Yankees Encyclopedia (Sixth ed.). Champaign, Illinois: Sports Publishing. ISBN 1-58261-683-3. Retrieved September 7, 2012. ↑ Williams, Ted; Underwood, John (June 17, 1968). "Smooth and Stormy Seasons – Part 2: Hitting Was My Life". Sports Illustrated. New York. 28 (24): 30–46. Retrieved August 31, 2012. ↑ "Fame renews ink of premier pitchers Lemon and Roberts". The Gazette. Associated Press. January 23, 1976. p. 21. Retrieved August 31, 2012. ↑ "Bob Lemon's Mom Can Die Happy". St. Petersburg Independent. Associated Press. August 9, 1976. p. 3-C. Retrieved August 31, 2012. ↑ "Roberts, Lemon All-Star Captains". St. Petersburg Times. July 6, 1976. p. 3C. Retrieved August 30, 2012. ↑ "1966 Pacific Coast League season". Baseball-Reference.com. Retrieved August 31, 2012. ↑ "Bob Lemon Honored as Manager of Year". The Milwaukee Journal. Associated Press. September 15, 1966. p. 2. Retrieved September 1, 2012. ↑ "Bob Lemon Makes Good Boss". Daytona Beach Sunday News-Journal. Associated Press. August 1, 1971. p. 2C. Retrieved September 7, 2012. ↑ Blount, Jr., Roy (June 22, 1970). "Tale of the Derailed Metro". Sports Illustrated. New York. 32 (25): 43. Retrieved August 31, 2012. ↑ "Metro Fired, Lemon Named". Reading Eagle. Associated Press. June 9, 1970. p. 2. Retrieved September 7, 2012. ↑ "KC Royals Rehire Lemon". The Palm Beach Post-Times. Associated Press. August 22, 1970. p. B4. Retrieved September 7, 2012. ↑ "Ex-Expo Williams named AL Manager of Year". The Gazette. Associated Press. October 19, 1971. p. 13. Retrieved September 7, 2012. ↑ Moore, Roger (March 21, 1972). "Lemon high On Royals Outlook". The Times-News. Hendersonville, North Carolina. Associated Press. p. 10. Retrieved September 7, 2012. ↑ "Lemon fired, McKeon gets job". The Gazette. Montreal, Quebec. United Press International. October 4, 1972. p. 47. Retrieved August 31, 2012. ↑ "McKeon Named To Guide Royals". The Tuscaloosa News. Associated Press. October 4, 1972. p. 15. Retrieved September 7, 2012. ↑ "Royals Blast Firing Of 'Super Manager'". Evening Independent. St. Petersburg, Florida. October 4, 1972. p. 1C. Retrieved September 7, 2012. 1 2 "White Sox Name Lemon Manager". The Palm Beach Post. Associated Press. November 17, 1976. p. D3. Retrieved September 7, 2012. ↑ "1976 Chicago White Sox". Baseball-Reference.com. Retrieved September 7, 2012. ↑ "Chicago's Bob Lemon predicts surprises". Boca Raton News. Christian Science Monitor. March 31, 1977. p. 5B. Retrieved September 7, 2012. ↑ Gammons, Peter (May 16, 1977). "Old Uniforms, New Sox". Sports Illustrated. New York. 46 (21): 53. Retrieved August 31, 2012. ↑ "Chicago's Bob Lemon named AL's top manager". Boca Raton News. United Press International. October 18, 1977. p. 1B. Retrieved September 7, 2012. ↑ "Veeck Hopes Doby Is No Lemon". The Milwaukee Journal. Associated Press, United Press International. July 1, 1978. p. 11. Retrieved September 7, 2012. ↑ Madden, Bill (October 10, 1978). "Bob Lemon Still In A Daze About NY's Great Comeback". Nashua Telegraph. United Press International. p. 24. Retrieved September 1, 2012. ↑ Goldstein, Richard (January 13, 2000). "Bob Lemon, 79, a Hall of Fame pitcher, Dies". The New York Times. Retrieved September 1, 2012. ↑ "Bob Lemon Is AL Manager Of The Year". The Portsmouth Times. Associated Press. October 25, 1978. p. 22. Retrieved September 7, 2012. 1 2 Richman, Milton (June 19, 1981). "As usual, Lemon goes gracefully". St. Petersburg Times. United Press International. p. 8C. Retrieved September 1, 2012. ↑ "Lemon May Manage Cleveland Indians". Frederick Daily Leader. United Press International. July 1, 1979. p. 1B. Retrieved September 7, 2012. ↑ "Bob Lemon Named Yankees' Manager". The Daily Times. Portsmouth, Ohio. Associated Press. September 7, 1981. Retrieved September 1, 2012. 1 2 Wulf, Steve (May 10, 1982). "This Time George Went Overboard". Sports Illustrated. New York. 56 (19): 40–45. Retrieved August 31, 2012. 1 2 3 4 5 "Bob Lemon". Baseball Reference. Sports Reference. Retrieved September 24, 2015. ↑ "Indians Retired Numbers". Mlb.com. Retrieved August 31, 2012.